Using the 12 Steps to Overcome ANY Addiction. Yes. You read that right. I said ‘Using the 12 Steps to Overcome ANY Addiction. I will show you how to use the 12 Steps to overcome ANY addiction. I will show you how to use the 12 Steps to overcome addiction, anxiety, depression and those horrible, harmful mood swings. I will show you how to use the 12 Steps on Relationship Problems. And, job problems. I will show you how to use the 12 Steps to totally rebuild and recreate your life. Oh, what an order? I’ll bet you think I can’t go through with it! You’ll come to see that the real obstacle to using the 12 Steps to recover is — YOU! Your inability to get totally and fearlessly honest with yourself. And, your refusal to take precise actions and your inability to follow directions. Note: Why am I using “I” instead of “we”? No. It’s not a grandiose ego or self-promotion. I simply want to make it perfectly clear that I am NOT — speaking for, nor am I a spokesman for any organization, A. A., or otherwise. I’m speaking as an “individual” sharing my own personal experience, strength and hope — and not the experience, hopes or claims of a “we” organization or anyone else. I have nothing that I am trying to sell you, nothing to promote to you, and nothing to get you to join. Just the facts — if you want facts. How’s that for some HUGE 12 STEPS PROMISES? Well. There’s a whole lot more that you can use the 12 Steps on — but the list is too infinite to list here. Besides — why tell you about it, if you’re not going to follow the instructions and do the work to experience it? You’ll be a doubter — until after you’ve taken action. You don’t manufacture faith. Unless you’re manufacturing ‘Fake Faith’ — that will not get you very far in life. Real faith comes as a result of taking actions. With ‘Fake Faith’ — when real storms of life hit you, you’ll bail out and run. REAL FAITH — comes as the result of taking actions. You come to believe — because you’ve seen it with your own eyes, and experienced with your own experience. You become convinced because you’ve lived it. That’s why people criticize ‘people of faith.’ That’s why they criticize religion. It’s why people criticize God. The have an invested personal reason to be a denier. They’re looking for excuses. Looking for proof that they are victims that cannot solve their own problems. Looking to blame something or someone else for their own failure to succeed at solving their problem. The ‘critics’ are do-nothing phonies that sit around criticizing everything and everyone but themselves — about ‘faith.’ And, about the ’12 Steps’. They try to think their way through life criticizing others and everything. They have no faith in themselves. They take no ACTIONS other than ‘thinking and talking’ (or, writing). — They will never admit that they don’t know what they’re talking about — because all they do is think and talk. Many, simply do not know — that they do not know what they’re talking about. Others, have taken the wrong actions, not knowing they were taking the wrong actions. Some, have taken the actions backwards and in reverse — and will try to convince you and themselves — that something doesn’t work, because they’ve tried it and it didn’t work. Yes. I hear naysayers, saying ‘show me the proof’ of what you claim. And, to you – I say, ‘show me your proof’ that you can’t? The bottom line is ‘you have no proof’ that you can’t. You only have proof that you haven’t followed my directions and taken the actions that I’ve suggested that you take. And something more… There are more than 360 “Other than A.A.” Recovery Organizations, and Fellowships — who are currently using A. A.’s 12 Steps to recover from their addictions and conditions. 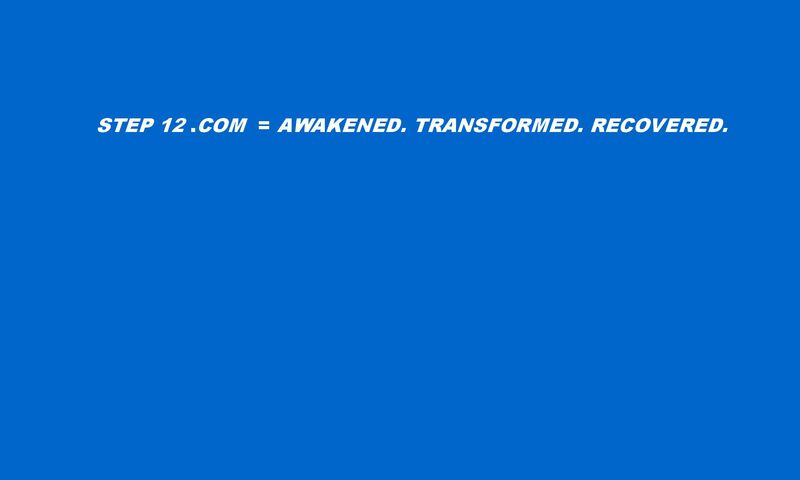 If you want more proof that this — that the 12 Steps CAN be used to treat ANY condition — you’re most likely one of the crowd of professional deniers, critics, doubters or haters — of the 12 Step Model of Recovery.